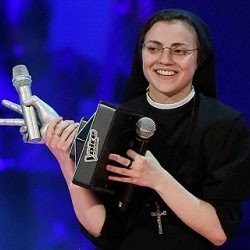 Watch performances of Singing Nun "Sister Cristina Scuccia"
The Catholic nun of the Dominican order from Sicily, Sr. Cristina Scuccia has won the grant talent show "The Voice of Italy 2014". She was so amazing on many levels of the show. She won the title on June 5 2014. She had became a world wide sensation after her amazing performance in VOI talent show. She has an angelic voice and amazing talent to reach the hearts of audience.﻿ The Mega Entertainment company Universal has approached her for recording contract. After the victory she thanked Pope Francis and all those who have supported and helped her to achieve this. She then recited the Lord’s Prayer, asking the studio audience to join in with her. 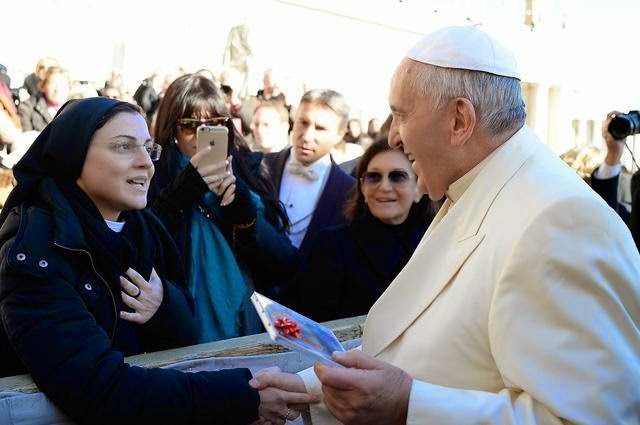 A handout picture provided by Vatican newspaper Osservatore Romano shows Pope Francis (R) speaking with Sister Cristina after receiving the copy of her music album as he arrives to Wednesday's General Audience in St. Peter's Square, Vatican City, 10 December 2014. Watch the VOI audition video, the Judges were wondered by here astonishing performance and angelic voice. Sr Cristina isn't the only religious with a singing career. 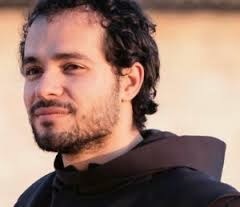 Friar Alessandro or Brother Alessandro is another such person. he is known as the singing Franciscan. One of his famous albums is "Voice From Assisi" which was released on October 15 2012. He is also the first religious brother to land an exclusive record contract with Universal. Debut Album " Voice from Assisi"